Work seriously sophisticated style vibes in this statement jumpsuit. 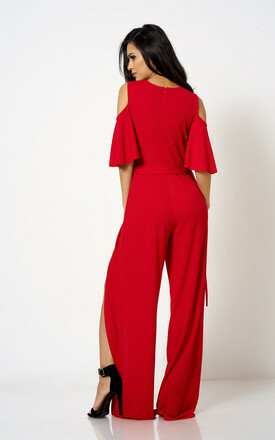 Our Club L Go With The Flow Split Leg Jumpsuit is crafted from mid weight stretch scuba crepe and is a season staple. Featuring cold shoulder frill sleeves, zip fastening, and a nipped in belted waist- these fierce split leg trousers will make maximum impact with minimal effort. Team with some killer heels to complete ultimate Valentines date night look.